Southern Shirt was founded by Bryan Webb in 2006 with a simple concept: develop super comfortable pocket tees that everyone will love. Those comfy tees quickly developed a loyal and energetic following that has been instrumental to the brand’s success. 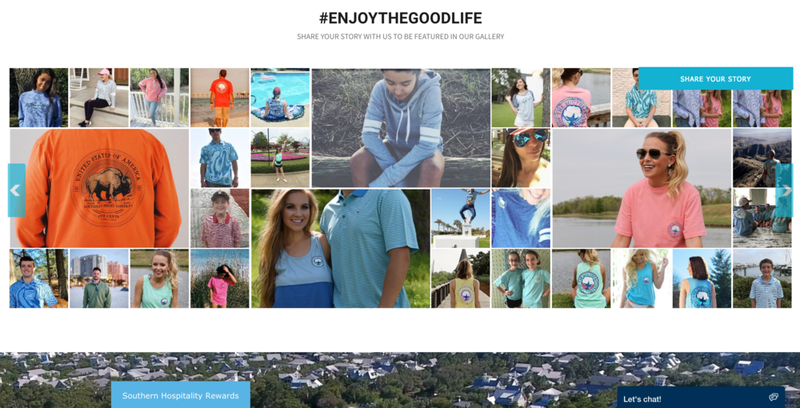 By putting an emphasis on listening and engaging with their customers, Southern Shirt continues to develop high quality product lines designed to fit their customers' lifestyle. Today you can find Southern Shirt at over 250 retail locations across the United States. From versatile men’s button down shirts to fun women’s throw on and go pullovers - quality, comfort, and the "perfect fit" are at the core of what Southern Shirt stands for. With over 237,000 Instagram Followers, Southern Shirt has an incredibly loyal customer base. They place their customers front-and-center, with a bold display of customer generated content in the middle of their homepage. Southern Shirt uses our StoryBox Display Module, which provides for a horizontally scrolling gallery with different sized content tiles. As users hover over any tile, the StoryBox Display Modules zooms in on the image, inviting visitors to click. Clicking on any content tile shows the customer's photo or video, as well as the product they're wearing. This makes it easy for website visitors to purchase the item they see in each image. 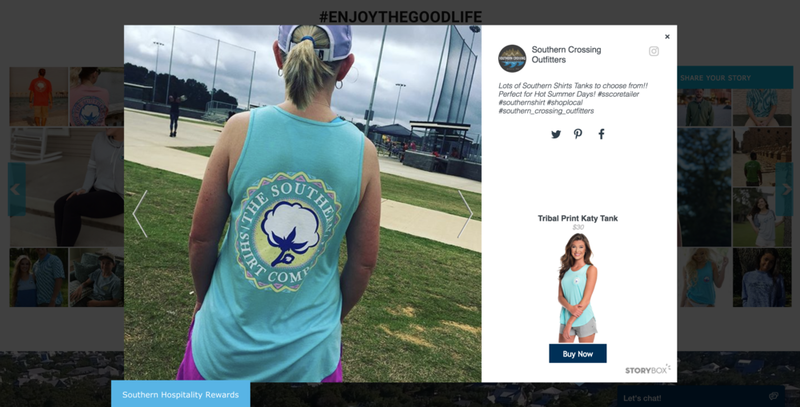 Additionally, the Southern Shirt community can share their own photo or video directly on Southern Shirt's homepage, or via the hashtag, #EnjoyTheGoodLife. Directly beneath their primary product image on each Product Detail Page, Southern Shirt displays our StoryReel Display Module. This features the customer photos and videos directly related to the product on the page. Now, when a website visitor looks at a product, they get to see what it looks like on real people. This is so much more powerful than a model or stock image. Additionally, customers can submit their own photo or video directly on the Product Detail Page.